To explore the mechanism and efficacy of the modified bladder neck intussusception in laparoscopic radical prostatectomy (LSRP) on postoperative early continence. We prospectively collected clinical information of prostate cancer patients who underwent LSRP with modified bladder neck intussusception (n = 10) and non-intussusception (n = 10). 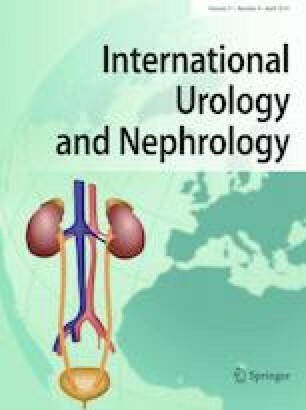 At postoperative 1 month, the prostate-specific antigen (PSA), pad test, real-time magnetic resonance imaging (rt-MRI), and flow rate were performed. At postoperative 3 months, the PSA, pad test, international prostate symptom score (IPSS), overactive bladder symptom score (OABSS), incontinence questionnaire short form (ICI-Q-SF), and quality of life (Qol) were recorded. The intussusception and non-intussusception patients had similar baseline characteristics. At postoperative 3 months, intussusception patients had lower OABSS than non-intussusception patients (P = 0.038). The non-intussusception patients suffered from more severe incontinence (P = 0.026). The continence rate of intussusception patients was significantly higher (90% vs. 20%, P = 0.005). And intussusception patients had significantly lower Qol scores (P = 0.038). According to the morphologic analysis by rt-MRI, there were 7/10 non-intussusception patients and 2/10 intussusception patients having funnel-shaped bladder necks at Valsalva movement. The intussusception patients had larger angle between anterior and posterior wall at bladder neck (P = 0.029) and longer length of functional posterior urethra (P = 0.029). During micturition, the intussusception bladder neck was found to move less dynamically on X-axis and Y-axis, but the difference did not reach significance. The modified technique of bladder neck intussusception in laparoscopic radical prostatectomy prolongs the length of functional posterior urethra and is effective to improve postoperative early continence. Lin Yao, Yuke Chen, and He Wang contributed equally to this manuscript. The online version of this article ( https://doi.org/10.1007/s11255-019-02118-0) contains supplementary material, which is available to authorized users. This work was supported by Grants from the National Key R&D Program of China to Shiliang Wu (Grant number 2018YFC2002200). Study Concepts: Zhisong He and Shiliang Wu. Study Design: Wei Yu, Zhisong He, and ShiliangWu. Data Acquisition: Lin Yao, Yuke Chen, and He Wang. Quality Control of Data and Algorithms: Yuke Chen and Yu Fan. Data Analysis and Interpretation: Yuke Chen and Yu Fan. Statistical Analysis: Yuke Chen and Yu Fan. Manuscript Preparation: Yang Yang, Jihong Duan, Yunxiang Xiao, and Yu Fan. Manuscript Editing: Yuke Chen. Manuscript Review: Qian Zhang, Wei Yu, and Shiliang Wu. The authors of the present manuscript have no conflicts of interest.